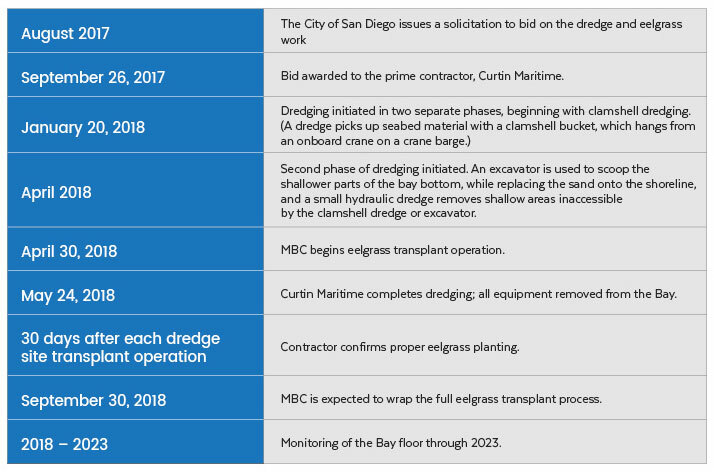 Last year, the City of San Diego issued a solicitation for a “Navigational Safety Maintenance Dredge Project,” in Mission Bay, as a result of multiple public safety and private vessels experiencing difficulty navigating with shoals present within the bay. Dredging was scheduled to remove sediment over approximately 63 acres of bay bottom, and dispose of the material in approximately 10 acres of deep basins in the bay. Accompanied to the dredging was a large eelgrass transplant project, needed in order to restore the bay floor to its pre-dredging status. 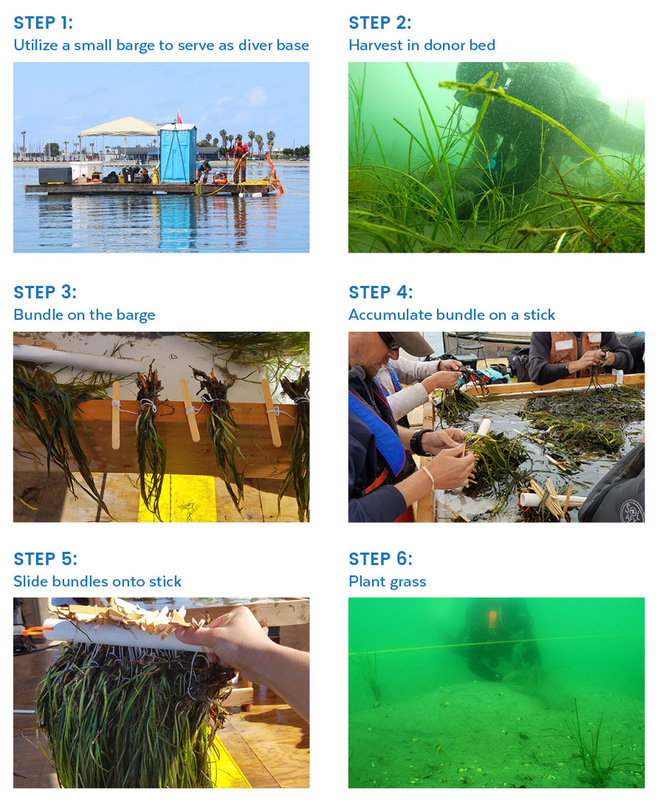 With 36 years experience in eelgrass transplants, MBC teamed up with Curtin Maritime, to perform the work for San Diego Public Works, and tackle what is known as the largest eelgrass transplant project on the West Coast. To kick off the project, Curtin Maritime dredged about 63 acres of the bay bottom in order to successfully remove the shoals. The dredging impacted over 40 acres of eelgrass. As eelgrass is a diminishing resource, dredging projects in the state of California are regulated on both the state and federal level, with the intent to mitigate every acre damaged. The state mandates that with every acre experiencing dredging damage, 1.4 acres of eelgrass must be planted in order to achieve a final success rate of 1.2 times mitigation at the end of 5 years. Once most of the dredging was completed and accepted by the City, MBC and Curtin Maritime brought in the transplant team of divers and eelgrass bundlers. For 5 days a week for up to 15 weeks, 25 determined individuals are transforming Mission Bay. March through October is the growing season for eelgrass, and is the time period during which eelgrass transplants are conducted, providing for the greatest regrowth on the ocean’s bottom. In late April, MBC commissioned five employees to head south on the I-405 to team up with the Curtin Maritime subcontractors and begin work on the largest eelgrass transplant project of it’s time. The main MBC team consisted of Bob Moore (Senior Scientist), Wayne Dossett and Jennifer Rankin (Senior Technicians), David Schuessler, Jr and Jennifer Smith (Technicians), and Samuel Schipper (Associate Technician). The team is treading with lofty goals for the ocean’s floor. As the dredging done at the beginning of the project heavily impacted the ocean floor, the eelgrass transplant will both restore and grow life at the bottom. MBC has conducted numerous successful eelgrass transplants, most recently in Newport Bay. In our 36-year history of conducting these projects, we’ve covered ground from San Diego and Mission Bays to San Dieguito Lagoon, Newport Bay, and Alamitos Bay, and to surveys of Los Angeles and Long Beach Harbors. 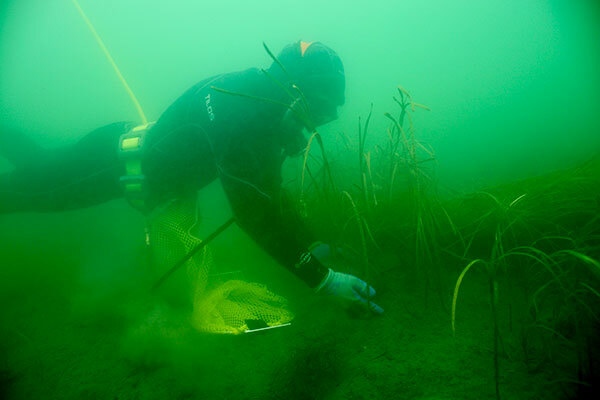 The impact of flourishing eelgrass on the ocean floor extends far beyond a grass bed. Eelgrass serves an abundance of purposes on the ocean floor, and MBC’s goal is to mitigate the damage of dredging in order to restore the bay bottom to the pre-dredging acreage. A number of species call the eelgrass home. Halibut, lobster and spotted sand bass use it as a nursery. It’s a haven for other sport fish and commercially-important fish and invertebrate species. The West Coast has lost approximately 90% of it’s eelgrass prevalence in the last 100 years, a result of growing populations and overall economic growth across Southern California. MBC is committed to making up for some of these losses, as we attempt to increase the amount of eelgrass nursery habitats. Increased eelgrass beds = Increased nurseries = Increased recruiting individuals that will survive up to adult size. So, how do we tackle such a mission? We’re certainly not blind to the unexpected speedbumps that were projected to arise with this size of the project. Our collaborative teams were ready (and continue to stand ready) to tackle each one. 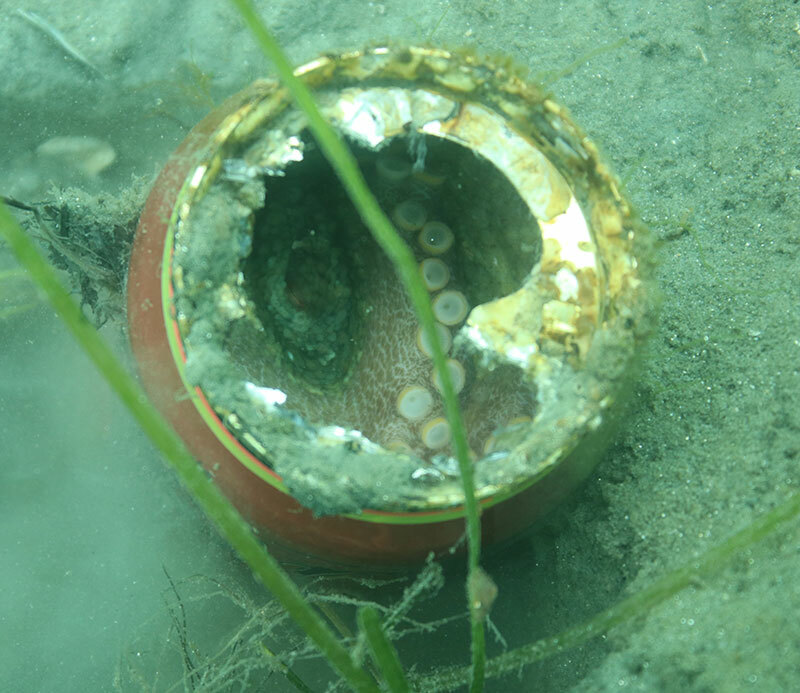 Firstly, snails and fauna, commonly found at the bay floor, multiplied rapidly after the bay bottom was freshly exposed by the dredge activity. The team has been mindful of this added nuisance in the planting process. Additionally, at the start of our eelgrass transplant, our team discovered that the donor beds identified in the City’s original mitigation plan did not have sufficient eelgrass within for the full project. Given our dedication to see this area flourish, MBC has partnered with the City and Merkel & Associates to identify new donor beds. Our vessel, Poco Loco, and the Simrad fathometer have been invaluable in identifying eelgrass beds on the bay bottom suitable to use as donor beds. 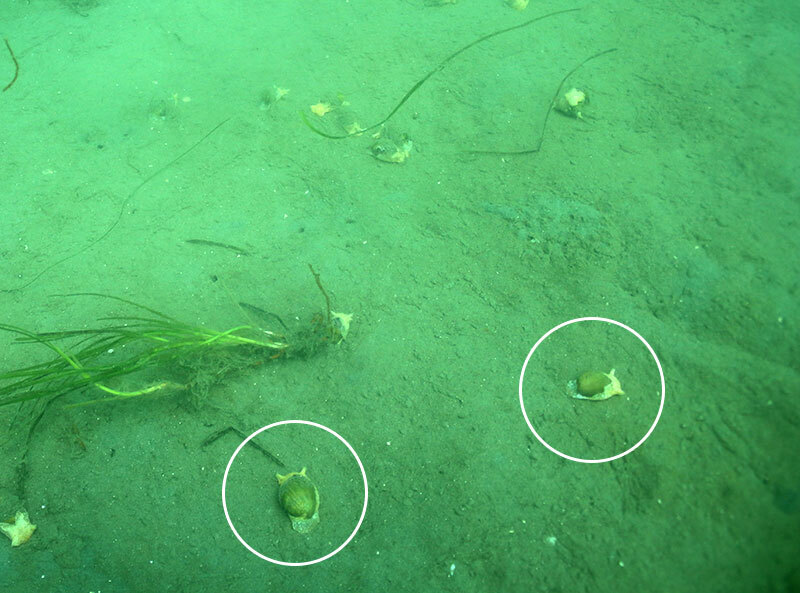 Visibility, a common issue in eelgrass transplants, has varied greatly during the transplant operations. The transplant process disturbs the sediments, and ultimately, slows down the process. The team has continued to keep a strong eye on the tides, in order to tackle the 18 acres of the deepest areas, those particularly impacted by the visibility. Finally, let us not forget the power of a diver down flag. First and foremost, we’re committed to safety for all teams involved. 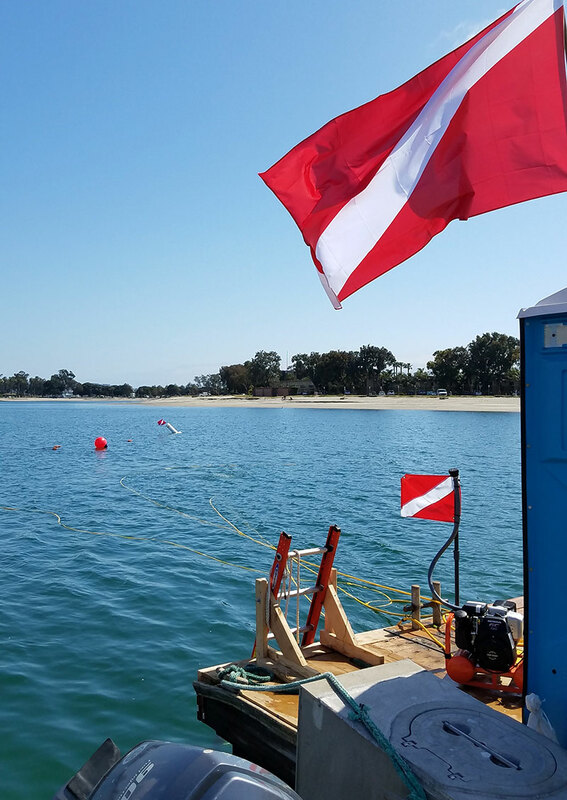 It’s estimated that 95% of visiting vacationers in Mission Bay are unaware of the meaning of a diver flag, and with life guards wide spread throughout the Bay, MBC is taking the lead on proper safety precautions to keep our teams safe. Upon the final transplant, Merkel & Associates will utilize a side scan sonar to drive over and map the eelgrass beds. In follow-up, a diver will go in to measure the specific densities, to ensure they’re in alignment with growth expectations. Our goal? To have all impact areas reach full areal coverage, as well as densities return to their pre-dredging levels. Merkel & Associates will continue to survey every 12 months, over a 60-month monitoring period. Our first eelgrass transplant project was back in 1982, incidentally in Mission Bay. 36 years later, our scope has certainly increased, but we’re still in the business of helping the bay thrive. Follow along as we wrap the project this fall via our social channels: Facebook, LinkedIn, Twitter.